Every six months to a year, you should visit us for a routine exam. It’s important to stay on top of your oral hygiene and health. We provide a comfortable office with all the amenities to make your visit a pleasant one. Our trusted team will take their time to make sure your teeth and gums are as clean as they can be. We train our staff to use a delicate touch. We’ll also teach you everything you need to know about staying healthy. You’ll leave our office feeling confident about your teeth and gums. Our exams are thorough, so you’ll know that nothing was missed. 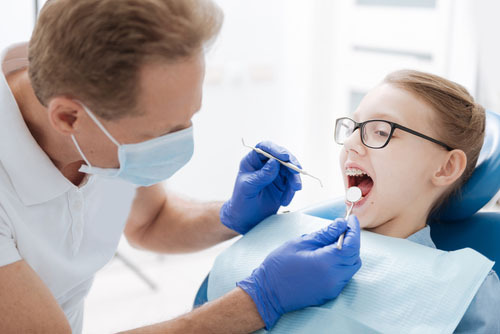 And if we find any cavities, we’ll make sure the fillings go in without pain or discomfort. We also offer tooth-colored fillings, which blend right in with your teeth. We want you to look forward to your annual dentist visits. Our general dentistry practice prioritizes your comfort. We’ll be hard on tooth disease and plaque without being hard on you. It’s our mission to provide the best dental care in a warm, friendly setting. The technology we use allows us to work efficiently. And our kind, caring staff will make you feel like a part of our family. I am so happy I chose Fischer Family Dentistry. Both of my kids enjoy their checkups and have healthy smiles. I can't thank you enough! Dr. Fischer is the best!